Uses IRF510s x 2 as PA and 2N3904 x 4 drivers in push-pull mode for low distortion transmission. MicroBITX: A simple to build, All band ham radio transceiver _NOT_ I purchased Version 3 and Version 4 when they first became available. Looking at the discussion groups, there were sooo many fixes and modifications needed to get the thing to work half way decently. Further circuit analysis showed that just about every sub-circuit had serious faults in it. It is so wonder that anyone got on the air with a decent signal, you spend more time fixing stuff than actually operating! Not to fear, I have been working on a brand new Parallax FLiP based ham transceiver for the last few months and making good progress. The software is pretty much written but still working on circuit details. Most of which are from various on-line and ARRL robust & proven designs. Interesting, is there a web page for what you have so far ? Will this port to P2 easily ? Web page, no. I don't want to use any of the "Crowd Funding" type of introductions. Sooo... for now I am just working on getting the circuit to work and lining up parts suppliers (read DigiKey), and a local electronics assembly company to produce the basic RF circuit board(s). I have built lots of kits in the past, and kits have a way of never getting finished. This radio is targeted to the more than half of all Hams that are licensed, but NEVER get on the air. I will post pictures of this radio ( code named ACORN ) on this thread later. Also planning on setting up a booth at the Orlando HamCation, Feb. 8, 9, & 10th. I love that you're using the FLiP module in your transceiver! It's an amazing product for a good price, and it would be hard to imagine a better entry ramp for designing a Propeller chip into one's product. ... I will post pictures of this radio ( code named ACORN ) on this thread later. Also planning on setting up a booth at the Orlando HamCation, Feb. 8, 9, & 10th. Maybe start a new thread, so the right title can apply, and you can also edit your first post to reflect updates ? What are you using for the clock/oscillators generate side ? No knobs, no LDC display, no extra "stuff" All the features of the Propeller have been used, all the software from these forums has been used. With no knob(s), or LCD, what form does the user-interface take ? I am using an RS-232 / capacitive touch keypad from FutureLec for all the front panel knobs & switches. The 16 keys can be user programed to do anything. Likewise I gave up on an LDC display. Using the VGA driver from Marko, with user programmable fonts and color palette. For clock and frequency generation I am using the available / built-in digital synthesizers on the Prop chip. Posts will be few, but intriguing! Your project sounds fascinating. I'm very interested. I am using an RS-232 / capacitive touch keypad from FutureLec for all the front panel knobs & switches. The 16 keys can be user programed to do anything. Likewise I gave up on an LDC display. Using the VGA driver from Marko, with user programmable fonts and color palette. That part will not port so well to P2, as it has only one SysCLK PLL, it drops PLLs in the timers. The SiLabs i2c Si5351A looks to be quite popular for VFO use, and there are an expanding range of Silabs Oscillators, covering a price/performance range. That's what the MICROBITX is using: It's based on a Arduino Nano controller and a Si5351 for all local oscillators. Bob VE1RRL - Yes that is the keypad. I use a paper overlay to redefine the keys, and the keys can be individually programmed to do what ever you want: VFO frequency, scan, read EEPROM, whatever you want. The uBITX uses a cheap mechanical encoder that will wear out in a few thousand cycles. Plus some of the uBITX functions are not very intuitive. I am using the built-in synthesizer function in the Prop chip. It may be too noisy. In that case I will go to the SiLabs Si5351A chip. BTW some of those frequencies may be noisy also, it is not perfect. Reports are that the uBITX has "lots" of spirs. Any other ideas on a digital frequency synthesizer (chip or otherwise) are welcome. Remember that I am using a 1st and 2nd IF frequency and mixing them using the SA612 ic chip(s) Challenging for sure. A quick web scan suggests most spur-issues are harmonics/mixer artifacts, which is less a master clock generator frequency issue, and more a downstream linearity & filtering & PCB design one. The master generator issues will mainly be close in, and one symptom there is cleaner frequencies that are simple exact relationships to the master crystal & avoid fractions on the output dividers. The worst ones will be those not quite aligned, where the PFD filter cannot average well enough. There is no free lunch, and as you use fractional PLLs the average frequency is digitally set, but the Phase Detector is fed a dithered frequency to achieve that, and that results in ripple on the VCO. The overall consensus seems to be the Si5351a is 'good enough' even with these effects. It is a low cost solution. If you calculate the repeat frame of that PFD dithering, you know where to look for the close-in spurs. Overall, the higher the internal VCO, the higher the PFD can be, and the less jitter results, and the better dithered PFD frequencies can be tolerated. Here is my table of Silabs i2c clock generators... where the VCO range and XTAL used are tabulated. The Si54x are fairly new, and have > 10GHz VCO's, whilst the Si570 has been around longer, and has a ~ 5GHz VCO, and there are comments on that on the web. Si544.A          55.05   0.2~1500     10.8            12.550082103    74mA CMOS   150fs RMS   Si544: 1: $20.38 @ Mouser, 5 part codes. Here are some tests of the Propeller PLL phase noise. I haven't tested the oscillator on the FLiP. Most of the plots do not show the effects of the jitter that occurs when the divider is not a ratio of small numbers. 1/2N is perfect, 2/N and 3/N are often quite good, but using a large number in the numerator is problematic. forums.parallax.com/discussion/167895/fastest-dds-128-msps-and-fm-transmitter/p1 It seems that I have not yet posted the code for the 80MSPS version. I never finished the code cleanup because of low enthusiasm for the project, both mine and others. You can avoid a lot of phase noise by avoiding the Propeller PLLs and driving it with a crystal oscillator. Perhaps the DDS for first LO and then choose a second LO that's an integer fraction of the Propeller sysclock. I'm not sure if that would cause strange problems. If you think my DDS code would be useful, let me know, I can help with adapting it. It would be easy to port frequency generation from the P1 timer to the P2 Goertzel and get far better performance at the same time. The initial setup is a bit more complicated, but afterward it's just one instruction to set the frequency. 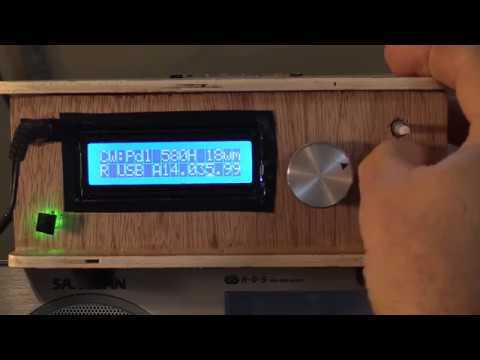 I will post pictures of this radio ( code named ACORN ) on this thread later. Also planning on setting up a booth at the Orlando HamCation, Feb. 8, 9, & 10th. Did you get it ready in time for the show? Do you have any pictures? I had a fantastic time at the Orlando HamCation 2019 show. 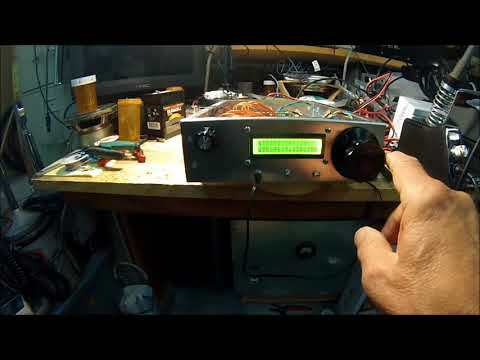 About 20 thousand hams showed up for the 3 day event this past weekend (2.08.2019) The ACORN transceiver is still very much a work in progress. I try to knock out one design / software / layout problem everyday. Most of the parts are from DK. The PCB board I make in-house using Sprite PCB Layout software (from Germany) for Gerber & G-code generation. The actual PCB board is isolation pad milled using a ShapeOKO CNC table-top machine, with a very sharp Silicon Carbide Engraving bit. Here are some pictures from the hamfest. I look forward to additional updates. Yep - that's me W1HV, vanity callsign from way back when! It uses a FLiP module and showcases just about every hardware and software feature available for the Propeller chip. There are few commands and features that are NOT used. So far I have: Keypad & Iambic Keyer & Debug using FullDuplex Serial/ 4 Ports by Chip & modified by Moore, i2c functions by Gadd, for all the peripheral devices (RTC @DS3231, EEPROM and a lot more), Prop Synthesizer function for frequency(s), VGA driver with 32 user characters and color palette from Marko Lukat, microSD card & software from FSRW 2.6 by Rokicki & Dummer, and a whole lot of sweat & original glue to get it all working. EVERYTHING you see in these photos is hard fought design and layout, mostly by hand! The actual PCB, enclosure case, ACORN logo, signage on the wall, tablecloth, ad copy, Bill of Material, process sheets, baskets of software. Except for the big electronics companies, I was the ONLY other ham transceiver designer and manufacturer at the show. What frequencies/precisions do you generate and how do you find that for Phase noise and spurs ? I am looking at a 1st and 2nd IF synthesized frequency using a Prop function. As of now and until I have some time under my belt, I do not know about the the Phase noise or Spurs. I have the option of using the Si5351A chip if need be, but it has its problems also. I am open to other IC chips. I started working on getting the original BITX working with a prop. Sadly i got stuck getting the SI5351 working with the prop so I didn't get far. I have a uBITX so would be happy to help if I can. The prop would be perfect for this application. That's great . Why not post your code and let us know what your having problems with . That way others can help. There have already been a few offers of help for this project and the prop. I just received a SI5351 breakout board to play with when I get time. I agree that the Prop1 or Prop2 would be great for this project. Bob, I took a look and seem to have misplaced the code. I'll take a better look and dig out my SI5351 board. If you are interested in collaborating on a BITX/uBITX controller shoot me a PM. Great!!! Now the fun begins. Putting it all together and with no magic smoke! BTW - I am interested in your first, and second, take on the uBITX transceiver. Hopefully you will not have as many problems as I have had. The ACORN radio (see above) is well on its way. 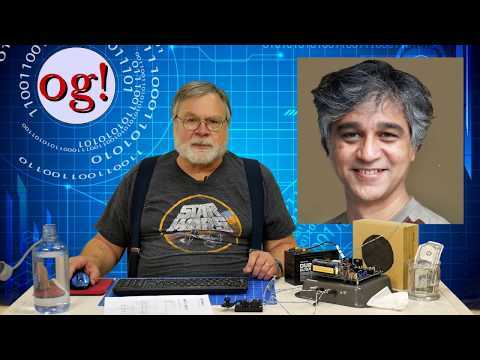 It has been about a month now - any comments on the uBITX ham transceiver? Did I see a report here on these forums where someone was using a Prop pin to generate a signal for rudimentary 72 Mhz R/C transmission? I can't seem to find this through a forum search.